Soaring, slender spikes of dark yellow flowers in early and midsummer rising above strap shaped, bluish-green leaves. 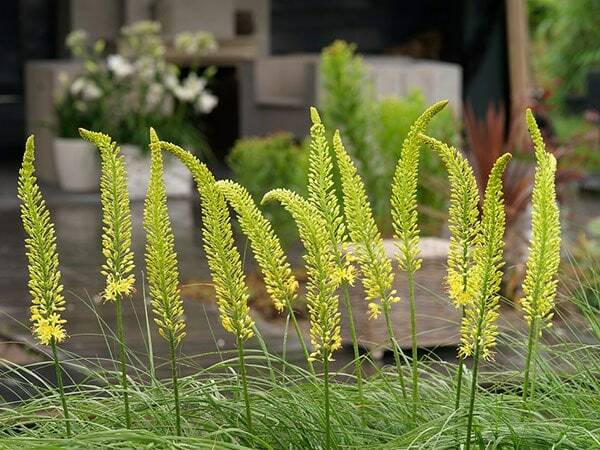 This spectacular foxtail lily is perfect for creating a bold statement in a sunny, well-drained border. The yellow flowers open from the base of the spike and darken as they age, creating a two-tone effect. It's best partnered with other late spring flowering perennials and tall grasses which help to mask the plant's short lived foliage. Garden care: In September every three to five years carefully lift and divide congested clumps. Replant the strongest crown on a layer of sharp grit, spreading out the roots if you can, and cover them with a thin (5cm/2in) layer of soil. In frost-prone areas cover with a dry mulch of fern leaves. 2 of the 3 grew well - beautiful tall yellow spires just as descrbied and flowers quite long lasting. I would buy more.